In this article, we consider the joint subcarrier and power allocation problem for uplink orthogonal frequency division multiple access system with the objective of weighted sum-rate maximization. Since the resource allocation problem is not convex due to the discrete nature of subcarrier allocation, the complexity of finding the optimal solution is extremely high. We use the optimality conditions for this problem to propose a suboptimal allocation algorithm. A simplified implementation of the proposed algorithm has been provided, which significantly reduced the algorithm complexity. Numerical results show that the presented algorithm outperforms the existing algorithms and achieves performance very close to the optimal solution. Orthogonal frequency division multiple access (OFDMA) is an efficient technology that has been adopted as the core technology for many wireless communication systems. Radio resource allocation plays a key role in optimizing the performance of OFDMA systems by exploiting the frequency and multiuser diversity gains. In general, the main metric in radio resource allocation is the system spectral efficiency. However, energy efficiency has attracted a growing attention recently as a key design criterion in communication systems [1–3]. The focus of this article will be on the system spectral efficiency and fairness among the users. For joint multi-cell subcarrier and power allocation (SPA), joint processing and/or coordination among the cells need to be considered. With joint multi-cell signal processing, the uplink channel will turn into MIMO multiple access channel, and all received signals are considered as useful. In this case, the system can be viewed as a super-cell virtual MIMO system. In the non-joint processing case, interference reduction is required by proper cell coordination mechanisms. Interference can be controlled by real-time coordination among all coordinating cells to avoid that two cell-edge users in neighbouring cells use the same subcarriers. Each scenario, either joint processing or coordination, has its own performance gain and signalling overhead cost. Proper trade-off between the achieved gain in the performance and the incurred signalling overhead need to be considered. We will consider the joint SPA problem for single-cell uplink OFDMA system. The objective is to maximize the users’ weighted sum-rate. The inter-cell interference is assumed to be mitigated by inter-cell interference coordination (ICIC) schemes . Once the inter-cell interference is controlled, the SPA in each cell can be optimized independently. The developed algorithm can be applied in conjunction with some ICIC schemes in the literature, such as partial frequency reuse, soft frequency reuse . By observing the optimality conditions in multiuser and single-user scenarios, we propose a novel suboptimal SPA algorithm. In addition, a simplified implementation of the proposed algorithm has been provided, which significantly reduced the complexity. The work that uses optimality analysis to develop suboptimal algorithms (e.g. [5–7]) mainly follows the multiuser optimality structure. Here, we argue that even though we look at a multiuser problem, the algorithm should follow the same structure as single-user power allocation. This is motivated by the fact that for a given subcarrier allocation (SA), the power allocation is a single-user water-filling (SUWF) for each user. Thus, our proposed algorithm follows SUWF structure and uses the multiuser optimality conditions only to obtain the SA criteria. A review of different approaches for radio resource allocation in uplink OFDMA can be found in . However, only [5–7] consider the problem of instantaneous sum-rate maximization (SRM) by centralized SPA, which is most relevant to the problem of this article. Hence, we use the algorithms from [5, 7] as benchmarks to evaluate the effectiveness of our proposed algorithm. The algorithms from [5, 7] will be referred to as Benchmarks 1 and 2, respectively. Benchmark 1 is developed by observing the optimality conditions and it has been proven to be Pareto optimal within a large neighbourhood of the solution obtained by the algorithm . Benchmark 2 uses a quite different approach as it iteratively solves a relaxed problem where the users are allowed to share the subcarriers. Then, a suboptimal solution is derived by hard mapping that allocates each subcarrier to the user with the highest share. The performance of the proposed algorithm will be evaluated and compared with the benchmark algorithms using spectral efficiency and fairness. Furthermore, the optimal solution of the relaxed problem, which serves as an upper bound, will be considered in the comparison. The remainder of this article is organized as follows: Section 2 presents the system model. The optimality conditions are analysed in section 3. The proposed algorithm and its simplified implementation are presented in sections 4 and 5, respectively. In section 6, we evaluate and compare the performance of the algorithm. Finally, section 7 is devoted to concluding remarks. where g k , n = h k , n 2 / N 0 B N is the channel signal-to-noise ratio for user k on subcarrier n, and h k,n is the channel gain that user k experiences on subcarrier n. N 0 and B N are the noise power spectral density and the subchannel bandwidth, respectively. x k,n is the SA index, where x k,n equal to 1 if subcarrier n is allocated to user k, and 0 otherwise. w k is the weight associated with user k. If all the users’ weights are equal, the problem turns to SRM. In this section, we will present the optimality conditions for multiuser and single-user resource allocation problem. From the analysis of the multiuser case, the criteria of allocating the subcarriers to the users will be obtained. The single-user power allocation will reveal the structure for designing a suboptimal algorithm. Then the insights gained from the optimality conditions will be combined to propose a suboptimal algorithm for SPA in the following section. x k , n ≥ 0 , ∀ k ∈ K , n ∈ N.
It can directly be verified that the relaxed problem is convex and has no duality gap . Consequently, the Karush–Kuhn–Tucker conditions are necessary and sufficient for optimality of the relaxed problem . This relaxation cannot be used in practical systems because it implies more than one user share the same subcarrier. Based on this relaxation, it has been shown in  that a necessary condition for the optimal solution that a subcarrier should be assigned to the user who has the maximum utility on that subcarrier, i.e. k ⋆ = arg max k ∈ K w k log ( 1 + p k , n g k , n ) . The SA criterion in (7) is based on the fact that when the primal problem is convex, the duality gap between the dual problem and the primal problem is zero . Consequently, the maximization of the main objective function can be done by maximizing on each subcarrier . However, when the primal problem is not convex, it implies a gap between the primal and dual solutions, which is the case of the SPA stated here. An alternative SA criterion which can heuristically be derived is explained as follows. Let R k a be the rate of user k using the subcarriers that already allocated to that user, and R k be the rate if an extra subcarrier is allocated to the user. We would like to allocate one more subcarrier to one of the users. So, intuitively we have to allocate a subcarrier to a user that will achieve the maximum increase in the objective function (1), i.e. k ⋆ = arg max k w k ( R k - R k a ) . We will refer to the SA criteria in (7) and (8) as SA1 and SA2, respectively. ∑ n ∈ N p k , n = P k , and p k , n ≥ 0 , ∀ n ∈ N.
where [x]+= max(0,x) and λ k are known as the water-level that should satisfy the power constraint in (10). The SUWF solution can be found iteratively by sorting the subcarriers in descending order g k,Π(1)≥g k,Π(2)≥⋯≥g k,Π(N), where Π represents a permutation. Then, starting with the best subcarrier g k,Π(1), the water-level and power allocation are calculated from (12) and (11). Then the best unallocated subcarrier is considered (we will refer to this subcarrier as the desired subcarrier), and the water-level and power allocation are recalculated according to (12) and (11). This process is repeated until non-positive power allocation happens (i.e. 1 g k , Π ( i ) ≥ λ k ( i ) ). λ k ( i ) = P k + 1 / g k , Π ( i ) , if i = 1 , ( i - 1 ) λ k ( i - 1 ) + 1 / g k , Π ( i ) i , otherwise . Select for each user its best unallocated subcarrier (i.e. desired subcarrier) and perform SUWF over the subcarriers already allocated to the user and the desired subcarrier. SA1: Compute the rate of each user on its desired subcarrier and allocate a subcarrier to the user that has the maximum utility on his desired subcarrier as in (7). 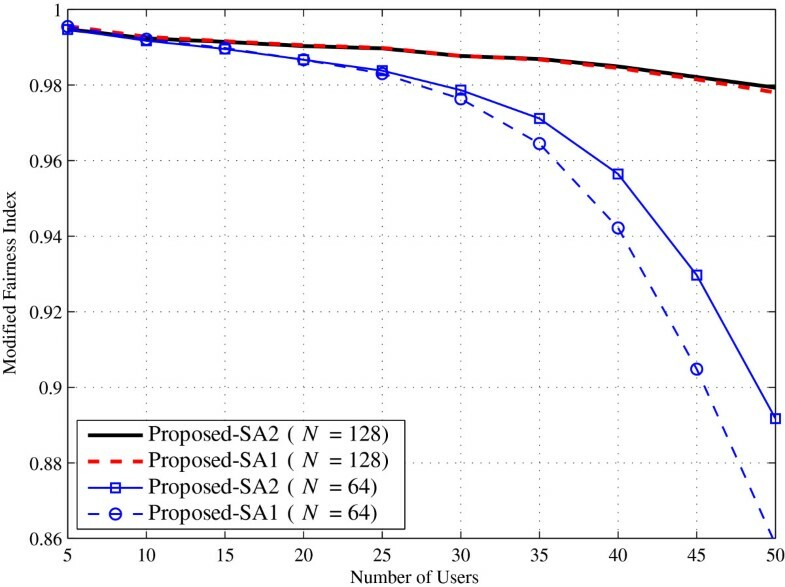 SA2: Compute the users’ rates R k using the power allocation from step 1 and compute R k a by performing SUWF over the subcarriers already allocated to the user. Allocate the desired subcarrier to the user that achieves the maximum increase in the objective function as in (8). Repeat steps 1 and 2 until all subcarriers are allocated then perform SUWF for each user. In benchmark 1, the SUWF is performed for each user on the allocated subcarriers plus all unallocated subcarriers. In contrast, in our algorithm, the SUWF is performed for each user on the allocated subcarriers plus the desired subcarrier only. where R k max is the maximum rate that the k th user can achieve when there are no other users in the system (which can be found by using SUWF). An iterative approach can be used to find the users’ weights that give the balanced rate vector. Starting with arbitrary users’ weights, the users’ rates can be found using the proposed SPA algorithm. Based on the resulted rate vector, the users’ weights are updated using the algorithm from [12, Equations (47–50)]. The updated weights are plugged again in the proposed SPA to find new users’ rate vector. The process keeps iterating until either the number of iterations reaches a given threshold or the difference in the users’ rates between two successive iterations vanishes. u k = w k log ( 1 + P k g k , l k ) , if A k = ϕ , w k ( | A k | + 1 ) log | A k | λ k a + 1 g k , l k | A k | + 1 + log ( g k , l k ) - | A k | log ( λ k a ) , otherwise . Consequently, the SUWF operations and the calculation of the users’ rates are replaced by the evaluation of a single equation. The complete proposed simplified implementation is given in Algorithm 1. The algorithm complexity with simplified implementation is provided in Table 1. It can be seen from the table that both SA1 and SA2 have a complexity of O ( N ( K + 1 ) ) , which is lower than that of the fast implementation of the benchmark 1 that has a complexity of O ( NK log 2 N ) . Also, comparing to benchmark 2, which has a complexity of O ( KN ( 1 + N ) L ) (L is the number of iterations), our algorithm has far less complexity. Jain’s fairness index = ( ∑ k = 1 K R k ) 2 K ∑ k = 1 K R k 2 . In addition to the benchmark algorithms, the performance of the proposed algorithm is compared with the optimal solution of the relaxed problem, which is calculated using the iterative algorithm in . As the relaxed problem implies that the users share the same subcarrier, it is not practical for implementation. Nevertheless, it can serve as an upper bound for the performance. 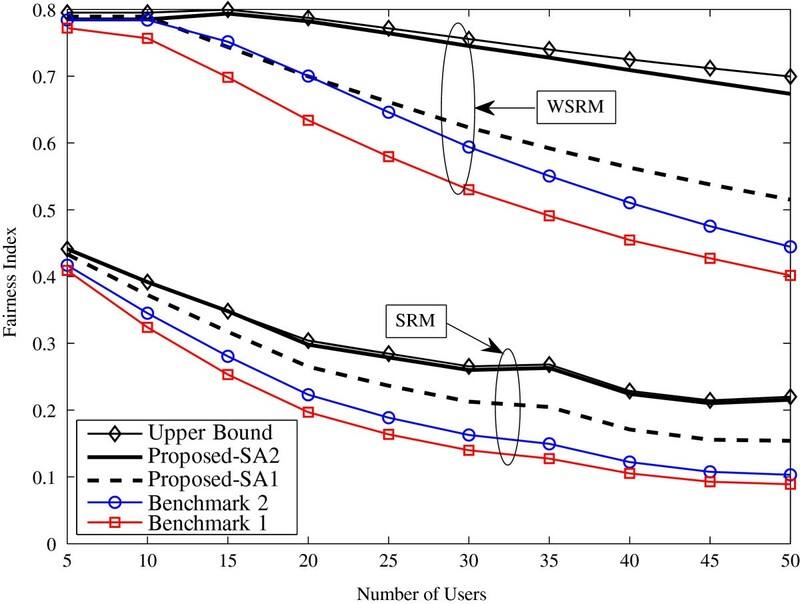 Figure 1 shows the spectral efficiency versus the number of users (K) for SRM and WSRM. In the figure, the proposed algorithm, Algorithm 1, with the two SA criteria (SA1 and SA2), the benchmark algorithms and the upper bound are indicated as Proposed-SA1, Proposed-SA2, Benchmark 1, Benchmark 2 and Upper Bound, respectively. It can be seen that the performance of our proposed algorithm SA2 outperforms the benchmark algorithms in both cases and achieves very close performance to the upper bound, especially for WSRM. On the other hand, SA1 outperforms the benchmarks in the SRM case and for high number of users in WSRM case. As it is clear, SA2 achieves higher spectral efficiency comparing to SA1, especially for the WSRM case. This because in contrast to the SA1 criterion, SA2 takes into account the reduction in the rate on the allocated subcarriers due to the change in the power allocation, which makes it more effective in maximizing the objective function. For SRM, SA2 and SA1 achieve in average 98.2% and 97.2% of the upper bound, respectively, while the benchmarks achieve only 92.4% and 94%. For WSRM, SA2 and SA1 achieve in average 99.6% and 88.2% of the upper bound, respectively, while the benchmarks achieve 80.6% and 90%. These percentage values are the ratio between the spectral efficiency achieved by the suboptimal algorithm and the upper bound averaged over all the values of K. Figure 2 shows the Jain’s fairness index versus the number of users (K) for SRM and WSRM. It can be observed from the figure that SA2 has the highest fairness and it is significantly fairer than the benchmarks. Also, the fairness of SA2 is very close to the upper bound. Although it is not as fair as SA2, SA1 is fairer than the benchmarks. 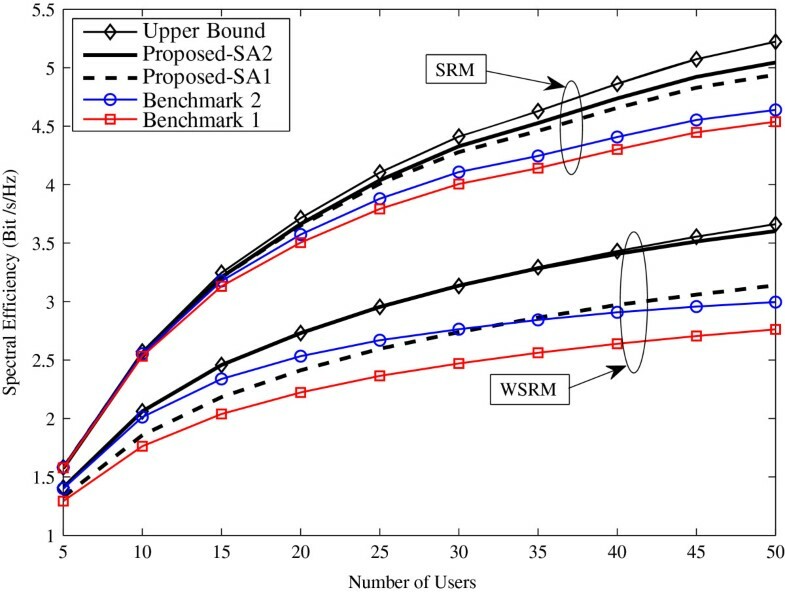 Spectral efficiency comparison of the proposed algorithm and the benchmarks for SRM and WSRM. Jain’s fairness index comparison of the proposed algorithm and the benchmarks for SRM and WSRM. MJFI = ∑ k = 1 K R ̄ k 2 K ∑ k = 1 K R ̄ k 2 , where R ̄ k = R k R k max . Clearly, MJFI is bounded between 0 and 1 with the maximum achieved by the balanced rate vector ( R ̂ ) . Figure 3 shows the MJFI for the proposed algorithm with weights optimized to achieve the balanced rate vector using the algorithm in . It can be noticed from the figure that for N equal to 128, the proposed algorithm achieves performance very close to the upper bound (i.e. MJFI = 1). On average, the achieved MJFI is 98.8% of the upper bound. Moreover, it can be noticed that when the number of users is close to the number of subcarriers (i.e. K≃N), the balanced rate vector is not feasible. This fact has also been pointed out in . Performance evaluation of the proposed algorithm with users’ weights optimized to achieve the balanced rate vector. Considering the results altogether, it can be concluded that the proposed algorithm SA2 outperforms the benchmark algorithms and achieves near optimum performance in both spectral efficiency and fairness. Consequently, proposed algorithm SA2 is a preferred solution since it achieves better performance and lower complexity than the benchmark algorithms. Furthermore, SA2 is more spectral-efficient and fairer comparing to SA1. As the two SA criteria have a comparable complexity, SA2 is preferable for practical implementation. In this paper, we considered joint subcarrier and power allocation for weighted sum-rate maximization in uplink OFDMA system. Using the optimality conditions for multiuser and single-user resource allocation, we proposed a suboptimal subcarrier and power allocation algorithm with two subcarrier allocation criteria. Furthermore, a simplified implementation of the algorithm is proposed to reduce the complexity, and a brief complexity evaluation is provided. It is shown that the simplified implementation of the algorithm has complexity of O ( N ( K + 1 ) ) , which considerably low comparing to existing algorithms. Simulation results showed a noticeable performance improvement in spectral efficiency and fairness comparing to the benchmark algorithms proposed in [5, 7] under different settings; SRM and WSRM. One subcarrier allocation criterion (SA2) has shown better performance in spectral efficiency and fairness comparing to the other criterion (SA1), and achieves near optimum performance. Finally, it can be concluded that our proposed algorithm is more efficient and less complex comparing to existing work, and achieves performance very close to the optimal solution. This study was sponsored by the UK Engineering and Physical Sciences Research Council (EPSRC) under grant number EP/J017655/1. The authors would like to acknowledge its financial support.